From the author of The Preacher's Wife comes the story of the most famous Christian hymns to have ever been written. It started with a voice and became an anthem song for generations of Christians to come. John Newton, a young sailor adrift in life and oceans, feels lost. Whilst working aboard a ship one night, and with the weight of his father's reputation and status upon his shoulders, the younger Newton hears a unique voice weave its way between the weather-beaten boards of the ship, and is enchanted. To him, this was a voice like no other. A voice to fall in love with. Following its soft, sweet tones and elegant melodies, John Newton discovers the beautiful sources of the enrapturing sound. The young Miss Polly Catlett. Overcome with the desire to win her affections, John wishes to woo the young Polly's affections, but soon reaches a stumbling block. Polly's Father. Seeing only an aimless young sailor with no good intent, and a reckless nature about him, Polly's father doesn't hesitate in forbidding the young sailor's affections. Despondent, forced into joining the navy and separated from Polly for four years, John begins to to see anew the world around him. Slavery. England and France poised on the brink of war. Green and misery. All these change John, bringing him to a new heart and a new faith. Turing against the very trade which made his family's legacy, John joins the growing fight against slavery. But will Polly stand by this new John Newton against a sea of opposition? Charting the incredible story of the beloved hymn, award-winning author Jody Hedlund creates a moving novel based on the love behind the the song that changed the world. The wonderful love behind Amazing Grace. Newton and Polly by Jody Hedlund was published by Authentic in September 2016 and is our 8796th best seller. The ISBN for Newton and Polly is 9781601427649. Be the first to review Newton and Polly! Got a question? No problem! Just click here to ask us about Newton and Polly. Acclaimed novelist Jody Hedlund brings the real story of "Amazing Grace" to page in a thrilling tale of the love story of John Newton and Polly Catlett. 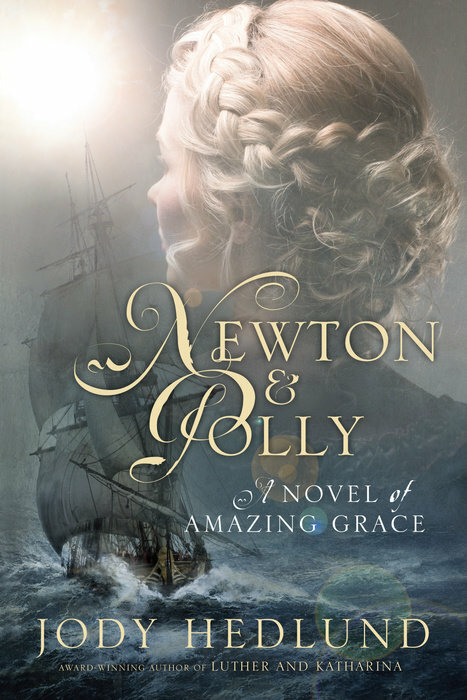 John Newton fell in love with Polly Catlett at first sight. But Polly was unable to return the affections of the rebellious, worldly young man and her father ordered the aimless John away from her. Not long after, John was pressed into serving in the Navy. He saw Polly one last time before leaving England but Polly couldn't promise any future to him. After four years away, John is called back to England on family matters. But John was heavily, blindly involved in the slave trade and had no desire to return. John Sr. used his son's undying love for Polly to lure him home. On that treacherous voyage back to England, in the midst of a terrible storm, John finally experienced salvation and began moving towards, eventually, crusading against slavery. Back at home, John must work hard to convince wise-beyond-her-years Polly Catlett that he is a changed man and worthy of her.